In the coming decades, racial and ethnic minorities will constitute more than 50% of many states' populations -- including that of Colorado. Individuals of racial and ethnic minority status are disproportionally affected by disease and disability and have poorer health outcomes than do their white counterparts.1,2 These differences are disparaties in health. Even when minorities have the same insurance status, access, age income and chronic conditions, they still tend to receive lower-quality health care than the white population. Differences in access and quality constitute disparities in health care.3 Shifts in population, coupled with current inequalities in health status and quality of care, clearly establish the need for addressing these disparities. Recognizing the persistence of racial and ethnic health disparities, The Colorado Trust developed the Equality in Health Initiative in 2005. The Initiative provided funding for 14 organizations across the state of Colorado in the first funding cycle, supporting their efforts to reduce health disparities by addressing the needs of racial and ethnic minorities. The initiative intended to strengthen organizations' cultural competency so as to promote and ensure the following for racial and ethnic minority populations: 1) equality in treatment and medical services, 2) attainment of equal access to health care, 3) improvements of environmental conditions and 4) increased healthy behaviors. Grantees received technical assistance in three areas: cultural competency; program planning and implementation related to health disparities; and data collection and evaluation. 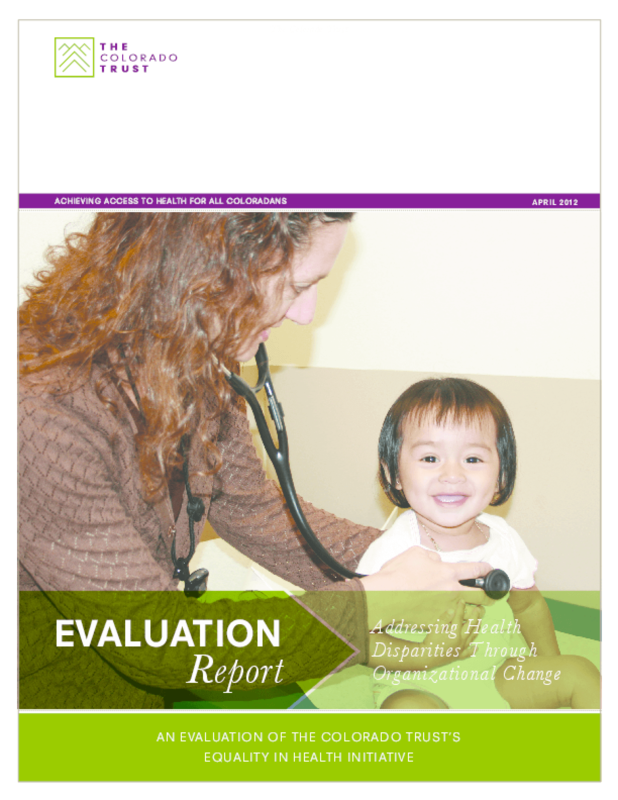 The Colorado Trust believed if grantee organizations' culturally competent practices improved through technical assistance, interventions and networking then short term health outcomes would improve as well, ultimately leading to reductions in health disparities. This evaluation examined this conceptual model to determine the role organizational cultural competency played in improving short-term health and health care outcomes for racial and ethnic minority groups. Results showed that as grantees' cultural competency in the form of community relationships improved, so did their adaptations to their interventions as well as short-term health and health care outcomes. Cultural competency in the form of organizational policies and procedures predicted improvements in the short-term health and health care outcomes of service recipients. Based on the results of this evaluation, a new conceptual model was developed and is described in this report. Facilitating and challenging conditions to developing cultural competency are also outlined as well as lessons for funders, policy makers and grantees.